On the first cup, you're a stranger, and on the second, a guest. By the third cup, you're family. First introduced to the West by Greg Mortenson's book title "Three Cups of Tea", the Pakistani tea proverb has been seized by Admiral Mike Mullen, Chairman of the U.S. Joint Chiefs of Staff, who is trying to make friends with General Asfaq Parvez Kayani seen by the Americans as the key to getting Pakistan's help in Afghanistan. The US military leader likes to tell people he's on his third cup of tea with the head of Pakistan Army, according to the US weekly magazine Newsweek. 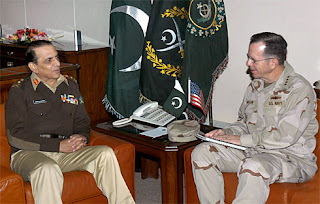 There has been a series of meetings between Adm. Mullen and Gen. Kayani in Islamabad, Washington, aboard the aircraft carrier Abraham Lincoln, and other locations since Gen. Kayani was appointed by President Musharraf as Pakistan's chief of army staff in 2007. Mullen thinks there has been significant progress. In an interview, Mullen has told NEWSWEEK that Kayani was making promises and keeping them. Mullen may want to return the favor. Last week, according to one of the sources, Pakistan requested more equipment, including Scout UAVs for reconnaissance and devices to intercept communications. And there's still the matter of those airstrikes, which Kayani says are fueling anti-US sentiments among the Pakistani people. During his recent Washington visit, according to Pakistani sources, Kayani and Pakistani ministers pressed Washington to halt unmanned Predator attacks, which in recent months have reportedly killed about a dozen top Qaeda and Taliban operatives, along with dozens of innocent civilians. The administration's response: no. It seems to me that the Pakistani tea analogy only applies when both parties seek a genuine alliance as equals rather than total compliance, which is effectively what US appears to be seeking from Pakistani military in the ongoing Mullen-Kayani talks. Regardless of the amount of money and equipment the US offers him, Kayani can not afford to be seen by Pakistanis as caving in to the US demands. Families do not expect their members and friends to attack the family home. The continuing American Predator strikes represent the biggest stumbling block in the way of serious and committed US-Pakistan military alliance in Pakistan-Afghan border areas. Mullen's experience with Kayani should serve as a warning for Amb. Holbrooke, the bulldozer, as he seeks Pakistan's help to resolve the crisis in Afghanistan. If Pakistan wants to move forward in a good direction, Kayani is defiantly in Pakistan's future. Yes, mush was the future five year back and one fine morning all the pakistan suddenly felt that he is not required and got zardari and suddenly they have the hope on kayani. Can for once pakistan have an agenda independent of rulers and focus on people and development. The best-selling book Three Cups of Tea, which follows the author Greg Mortenson's mission to build schools across Central Asia, is filled with inaccuracies, a US documentary says. The CBS 60 Minutes report alleges that his charitable foundation took credit for building schools in Afghanistan and Pakistan which do not exist. The documentary also says Mr Mortenson uses the charitable group as a "private ATM machine". Mr Mortenson denies the allegations. In an email he sent out to supporters and news organisations on Sunday before the programme was due to be aired, Mr Mortenson said the documentary based its claims on a single year's tax return to the US Internal Revenue Service (IRS). The report "paints a distorted picture using inaccurate information, innuendo and a microscopic focus on one year's (2009) IRS 990 financial," the statement said. He also posted a statement on the website of the Central Asia Institute, the charitable organisation set up to finance and build schools across the region. "I stand by the information conveyed in my book and by the value of CAI's [Central Asia Institute] work in empowering local communities to build and operate schools that have educated more than 60,000 students," the statement says. Three Cups of Tea was released in 2006 and became a best-seller through word of mouth. The book describes how Greg Mortenson, a mountaineer, got lost while trekking in northern Pakistan, only to be rescued by the residents of a remote village. In the book, he says the kindness of those he encoutered inspired him to build a school. The 60 Minutes investigation says that porters who accompanied Mr Mortenson dispute his claims of being lost. The documentary also alleges that a number of the schools in Pakistan and Afghanistan that were said to have been established by the CAI do not exist or were built by other people. Some principals said they had not received funds from the group for years, the report claims. The CAI's website says it has established more than 170 schools and helped educate more than 68,000 students. The programme also questions Mr Mortenson's financial relationship with the charity. The charity has answered the questions put to it by the programme in a statement posted on its website. As I travel around Pakistan this week and look at education issues across the country, including in the Federally Administered Northern Areas where Mortenson’s book Three Cups of Tea was set, I am struck by the bitter-sweet effect of these revelations. On the one hand, Mortenson’s book hid one of the country’s biggest educational success stories and promulgated a model of education assistance that has been proven time and again to be ineffective. On the other hand, his story captured the hearts of millions, bringing needed attention to the very real educational needs of Pakistan’s children and articulating the very important role good quality education can play in reducing conflict risk. Contrary to the Three Cups of Tea portrayal of Gilgit-Bultistan as a place with little educational opportunity, it is one of the regions in Pakistan that has demonstrated true educational transformation over the last 50 years. In 1946, just prior to partition from India, there were an estimated six primary schools and one middle school for the entire region. Today there are over 1,800 primary, 500 middle, 420 high schools, and almost 40 higher education institutions. Girls are often noted to be outperforming boys and staying in school longer. It is true that community leadership and civil society organizations have played a major role in this transformation; it just was not Mortenson’s Central Asia Institute. When I asked the governor of Gilgit-Bultistan, Pir Syed Karam Ali Shah, how this education transformation came about, he was quick to point to the Aga Khan Development Network (AKDN), a network of private, international, nondenominational development organizations, an assertion with which other education experts concur. Led by His Highness the Aga Khan, the spiritual leader of the Shia Ismaili Muslims, the concerted focus on improving education, and especially girls’ education, started in 1946 and has continued, led by community members, for decades. Initially starting in the Ismaili communities in Gilgit-Bultistan, the work spread quickly to other non-Ismaili communities in the region, when the clear economic and health benefits of educating girls were seen by neighboring communities. Many civil society organizations, government interventions and public-private partnerships have developed over time, helping to increase levels of human capital and capacity through heavy investment in education, particularly of girls. According to Mehnaz Aziz, member of the national Pakistan Education Task Force, if the rest of Pakistan could only follow in the footsteps of the people of Gilgit-Bultistan, the status of education in Pakistan would be greatly improved. ... Increasing access to quality education is likely to reduce Pakistan’s risk of conflict as cross-country estimates show that increasing educational attainment is strongly correlated with conflict risk reduction. Last month, a national campaign – Education Emergency Pakistan 2011 – was launched to spur country-wide dialogue on the need to prioritize educational investment and progress. It is unfortunate that the 60 Minutes expose has called into question the accuracy of Greg Mortenson’s books. Without defending Mortenson or whether the facts in his memoirs are accurate, I can say truthfully that there is indeed a very serious education crisis in Pakistan. The international community should not lose sight of this and the real needs of the Pakistani children and youth seeking to improve their lives.